Jessica Hall, Senior Director of Product Strategy and Design at 3Pillar Global, will be speaking at the Code Writers Workshop in Washington, D.C. on June 9th. Jessica’s talk, titled “There’s No Such Thing as Scope Creep,” will focus on the common misapprehension of scope creep by agile development teams. “In the agile software development world, ‘scope creep’ is something development teams are taught to avoid at all costs. It’s a frequent source of friction between technical teams and their stakeholders, and it can lead to a toxic environment when the balance swings too wildly in one direction or another. 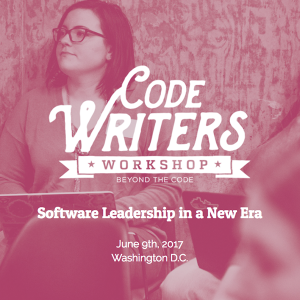 The Code Writers Workshop is a one-day event for software developers that is focused on going beyond the code. This year, the event features speakers, panels, and lightning talks that revolve around the process of building a strong team and developing a personal style of tech leadership. The featured keynote speaker is Kara DeFrias, who is the former Director of Experience Design for The White House. For more information on the Code Writers Workshop, including a schedule breakdown and where to register to attend, please visit the official workshop website.